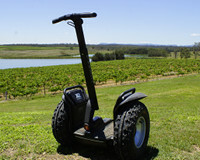 Nestled next to the Brocken Back mountain Range and overlooking the scenic views of the McGuigan's vineyard this adventure starts off with one on one instruction and training by a qualified Segway guide. 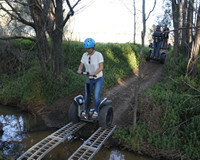 After everyone is comfortable riding the Segway the tour heads off travelling along the off road tracks and trails of the 1880's Stock Route that intersects the Hunter Resort property. Built by Australia's first settlers and convicts, you will encounter scores of kangaroos, possible foxes or hares and even the odd wombat or Goanna - all seen on past tours. The tour then ventures through the world renowned McGuigan vineyard, plus past the Hunter Valley Bottling Company on the way home. Here you get to appreciate the grapes in their natural state and then the finished product. This one hour tour + training ticks all the boxes incorporating beautiful scenery, historic facts of the region from its past to the present. Riding the latest technology in Segway personal transporters, this adventure is ideal for all ages from 11, all fitness levels and gender. So make sure you bring your camera, it's an experience not to be missed and will guarantee to put the WOW into your day and a smile on your face! 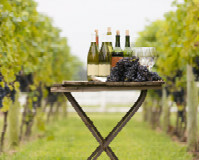 The Hunter Valley is Australia's oldest wine industry. You get to ride around this historic location soaking up its beautiful mountain scenes and natural ambiance. Our guides are well versed in the art of wine making. Plenty of interesting facts and tails to tell of the local wine industry. From growing, picking and bottling, we have it covered. There is no shortage of animals to see on the tour. From scores of kangaroos to countless sightings of large Goannas, foxes, frill neck lizards and the odd wombat. 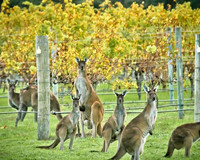 This tour has everything, from bush tracks and trails, to bridge crossings, riding through the famous McGuigan vineyard, to trying your hand at a couple of Segway challenges along the way. You will love it! Tour times available online - Please contact us or preferred online booking. All ages 11-91. Some degree of fitness is required. Please take along a camera. The Adventure Centre Hunter Valley (Hunter Valley Resort & Brew House site) – Corner of Hermitage Road & Mistletoe Lane, Pokolbin. Hunter Wetlands Centre Newcastle - 412 Sandgate Road, Shortland. The Adventure Centre Hunter Valley (Hunter Valley Resort & Brew House site) - Once you drive onto the Hunter Valley Resort site, follow the signs and dirt road straight ahead until you reach the Adventure Centre. Hunter Wetlands Centre Newcastle - After announcing your arrival at the front reception desk, we will meet on the deck below the cafe. A Segway is a battery-powered personal transportation device with no emissions - a green friendly machine. With a maximum speed of 20 kilometres per hour, it is electronically balanced and has a zero turning radius. Standing on the Segway, all forward and stopping movements are controlled by just leaning slightly in the direction you want to travel. Steering is as simple as leaning the handlebars to either side. They were originally designed to help with city transport congestion, we just use them to ride off road with a big grin on our faces! Riders must stand at least 110cm in height. Since riding a Segway requires you to be on your feet, you must be able to comfortably remain on them for no less than 75 minutes and capable of making minor shifts from front to back and side to side. Your ability to safely control a Segway will be assessed during the training phase of your activity. If, after an appropriate amount of training and familiarisation time, our trainers assess that you are not safely able to control the Segway, for your own safety and that of others, you will not be able to take part in the tour. For your riding safety, guests must be at least 11 years of age and weigh at least 35kg and not in excess of 118kg (no exceptions). There is no age limit, but as stated above you do require a degree of fitness and suitable flexibility in your movements to steer the Segway. How far do we travel on the tour? Our 1 hour tours are very similar in length, you will travel between 5.2 & 5.5 Km’s. There is also the training period before the tour begins. Simple to use and becomes quite intuitive in a short period of time, the Segway PT instinctively moves with you. Standing on a platform and holding the handlebars, you move forward and backward by leaning in the direction you wish to move. Once you are on board, 5 gyroscopes and 2 accelerometers sense changing terrain and respond to your body position 100 times per second. Yes. While the Segway balances for you, it is still under your control and relies on you to control its direction and speed. It is essential to know the limitations of your riding ability and the Segway and practice your skills accordingly. As when driving a car or riding any moving device, care and observation of hazards is essential in order to avoid collisions with obstacles. Paying attention at all times is required to ensure a fun and safe experience. Participants are required to wear enclosed shoes (No sandals, high-heels or thongs) but apart from this we simply recommend comfortable attire that is appropriate for the prevailing weather conditions. What if my party is more than 8 people? If the party is larger than 8 the group will be split up for safety reasons or special tours can be arranged on request. We ask that the client arrive approx. 10-15 minutes early for the scheduled tour to fill out necessary paperwork. Each member of your party will be required to complete and sign a liability waiver/indemnity form and fit a provided helmet. Tours are in English, but we have Mandarin and Japanese speaking guides. Please contact us in advance to schedule your preferred linguist. I've never ridden a segway before; will I be able to pick it up quickly? Your safety is always our highest priority; therefore, we begin each tour with a very thorough orientation of the Segway and its use before going out to enjoy the experience! But in most cases it only takes a matter of 30 seconds to one minute to feel comfortable riding a Segway. We understand that sometimes even with the best of intentions and commitment goes a little pair shaped. However from the time that you make your booking with us, we commit your places and hold them for you. This means that should someone else want to go on the tour you are booked on, we may not be able to take that person or people on the tour. We ask you to please understand that, should you cancel your tour, you will be charged a cancellation fee. This is, amongst other reasons, why we strongly recommend you consider travel insurance as a part of your trip planning. Cancellations received more than 14 days prior to the tour date will receive a full refund of the tour fee. Please note that a "cancellation" includes a change to the date of a tour booking that requires the original booking to be cancelled. Also please note our tours go rain or shine, so please come prepared for all weather conditions. In the event the tour can’t go ahead due to torrential rain and unsafe conditions, we offer full refunds to interstate and international travellers. We offer rescheduling or tour vouchers for NSW residents. At the end of the day our aim is to ensure you get on a Segway tour and enjoy yourself – we will do everything in our power to make this happen. Please contact us or preferred online booking.